^ Mark I. Greenberg; Samuel Proctor; William Warren Rogers; Canter Brown (1997). Mark I. Greenberg; William Warren Rogers; Canter Brown, eds. Florida's heritage of diversity: essays in honor of Samuel Proctor. Sentry Press. p. 84. ISBN 978-1-889574-03-5. ^ Thomas Donaldson; Fletcher Meredith; John Davidson; John W. Lane (1894). Revised by editors of the United States Census Office. 11th Census, 1890, ed. 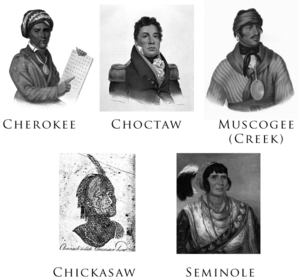 Indians : the Five Civilized Tribes in Indian Territory: The Cherokee, Chickasaw, Choctaw, Creek, and Seminole Nations. United States Census Printing Office. p. 7.